On occasion, Victorian Gardens Cattery has available adult Persian and Himalayan cats and Persian and Himalayan retired breeder cats. This page is set up for those special babies who were adopted as adults. Many are our retired breeders who now can relish in their retirement after giving our families beautiful babies to love. Parents are free to send pictures and post comments on their cats. We love hearing how everyone of our adopted cats are doing in their forever homes. Unfortunately, we had to spay Viola. We had such great plans for her and her breeding career. What lead to her being retired? She had a botched C-Section in 2017 at the hands of a very bad out of town Vet and an emergency C-Section/Spay on May 24, 2018, where her kitten had died in-vitro. In retiring her from breeding, we made the only hard choice possible in the circumstances. Viola is a very sweet girl and loves to knead dough on my chest. 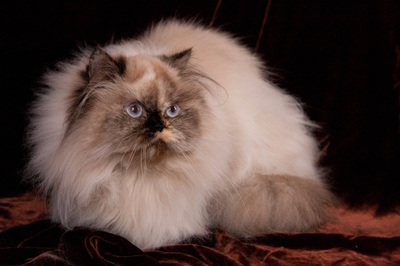 She is a CFA Champion and Grand Pointed Persian. She has an easy silky coat, nice small ears, smooth head, great boning and nice round copper eyes. She is very young at just under 2 years of age. You can see more pictures of Viola on our Dams page. Isaiah was a non-breeding member of our breeding program (helping to take our dams out of heat). He is a sweet, sensitive and easy going boy who gets along very well with all of our cats in our Cattery. He has very gorgeous large copper eyes and a beautiful cream coat. He is playful, and especially loves to play with the DaBird. You can see a recent video of Isaiah playing with the DaBird in his new lions cut below. He likes being petted and loves to be loved. Diamond is a Show Quality cat and has gone to Champion Status in the CFA Show Rings. She is a sweet girl and loves to be petted. We had to close her breeding career early since she did not like being a mother and taking care of her newborns. It just was not a good fit for her. Our sweet Pansy is a doll. What a character? She is so smart that she has already figured out "The Bug" (laser mouse) and where it actually originates from. You can't pull one over on her. As a baby kitten, her favorite spot was in the magazine basket or the antique chamber pot. Her name matches her face perfectly. She is very compact, cobby, heavy boned, with a shorter tail. When she was born she had the most silky and shiny jet black and red fur. Her fur is not prone to matting. She is very easy to take care of. She has round beautiful copper eyes. You can click on her picture to see additional pictures of Pansy. You may also see her at play in our YourTube Videos. Over the years, Primrose has had some beautiful babies. She is known for all those videos on YouTube where she is protective of her babies. Her fur also started popping out all over, including her cheeks after her spay. She is a beautiful cat. We now know where her babies got their cheek wings from. She is not a lap cat but a play cat. She is independent. She loves the D'Bird. She has beautiful copper eyes and a beautiful coat. As mentioned, Primrose is a favorite on our YouTube videos. We have provided her most famous video below for your enjoyment. You can see more of her videos by going directly to our YouTube channel. Also her pictures are provided throughout our website and in her Nurseries. Peony is a doll. Peony only had one litter and had to spayed due to an infection that was caught during her C-Section. Peony's father is Camelot, a sweet lap kitten. Peony is a very sweet lap kitten herself. Peony loves to be cuddled and loved. She loves playing with my fingers and hand under the covers. She will give as much love as she gets. 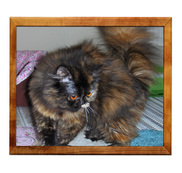 Peony is a beautiful Female Tortie Point Himalayan with an extremely beautiful and long coat. She is a smart little girl who loves to chase the laser light up and down the walls and doors. She has extra long ear tuffs and toe tuffs. She is a doll face with a flat face but not an extreme face. You can see her with her litter on our YouTube channel or in Peony's Nursery 2013. Petunia Lilymae is a Cream Point Himalayan. She has the traditional doll face with beautiful eyes that change from light blue to vivid blue depending on the lighting and the time of day. Her fur is very silky and soft. Petunia is our smart cat. She really is the brains behind each one of our smart kittens. She will have left a wonderful legacy in our lines at the Cattery. One of Petunia's tricks is that she loves to play fetch with her ball. You throw her ball across the run and Petunia is off and running for it. Of course she brings it back and sets it at your feet for another go around. She may need to relearn it since the small ball kept getting lost. Petunia has brought us so many special blessings in the form of very smart and gorgeous babies. We thank her for her years of dedication to motherhood. To download Petunia's pedigree, please click above. Petunia is more independent due to her smarts. She loves to be petted more than held. She loves being in close proximity to you. She can normally be found sleeping on the back of the sofa next to your head or on the arm of the sofa next to you. She also likes to sleep right beside your pillow at night. She will come to you and meow when she wants you to pet her. She is very smart so she will ask for what she needs. If you don't listen, she will keep asking. She still loves to play, especially with "The Bug". She gets along well with small dogs and usually ends up licking them if they let her. She was cardiac ultrasounded at The Sound Cat on February 28, 2012 and found negative for HCM. Dr. Williams commented that she had a nice strong heart for being six years old. In December 2012, Petunia went to live on a temporary basis with Tommy and his two neutered cats and our former sires, Chester and Camelot in their home in Tarboro, North Carolina. Petunia and the boys, including their dad, Tommy, adapted so well together that in early January, 2013, Tommy asked to make Petunia's adoption permanent. Petunia loves her daddy, Tommy, so much and you can tell she is very happy in her new home.